I am proud to announce that Gather Little By Little and the other M-Network blogs will be participating in Blog Action Day on October 15th. 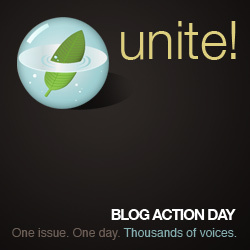 Blog Action Day will unite thousands of blog voices all talking about one issue: the environment. Personal Finance blogs including Financial Dominance, Gather Little By Little, I’ve Paid For This Twice, Moolanomy, Plonkee Money, Get Rich Slowly, and The Simple Dollar will be participating. Ironically enough, I had just published an article on making your money greener the day before I read about this effort. Anyway, look forward to reading all of the articles from the M-Network on October 15th! To avoid missing any of the M-Network articles, subscribe to the M-Network RSS feed. To participate, visit Blog Action Day and register.